Hahhaha I’m glad!!! I love the yarn ball at the bottom, so funny! hahahahha Are they speaking to you as well? Reblogged this on A Handmade Home. And if you can’t find the right project…I know where you can donate some squares (knit or crochet) for victims of tornadoes…hey….it’s helping me make good use of misc. yarn piles! :) Cute post! Yup, yup! I know full well! I finally tallied up a few projects I am going to force myself to do, and noted on my phone what needles I need to buy and possible additional yarn that I don’t have stashed. 5 possible projects. I’ve started on one and got one coming up, and for those and the future 3 more, I’ve had to buy so far, 4 circular needles, and 4 skeins of yarn. When I already have an overflowing box of circular needles and several (!) overflowing boxes of yarn. Hahahhahaha so what project are you working on now? hopefully this! had to buy 100% wool. WOW!!!!!!!!!! That’s such a great project!!!! I’m living in Toronto and there’s been a lot of talk about banning plastic bags forever!! It might happen in 2013! I can’t wait to see the tote when you are done! Too funny. And ::too:: true! 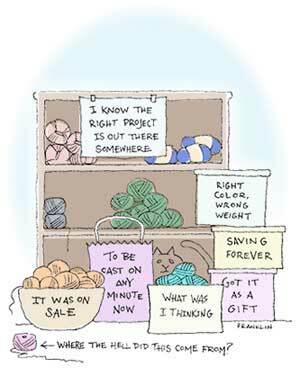 Hahahaha do you have a huge yarn stash as well? Oh man, yes. Even if I don’t need yarn, if I find myself in a store that sells it… I.must.have.yarn…. I mean, I have great self control! Ha! Tell me about it! Sometimes I wonder if there aren’t yarn-a-holic anonymous groups around. Oh, this comic can definitely apply to all those!! I have a collection of buttons that I never use but I just keep buying them! This is so true! Hope you manage to use your stash up on great project ideas. I hope so!! But… can’t… resist… saless… and random finds! Exactly my situation! Just with fabrics. hahaha Where do you store all ur frabrics!